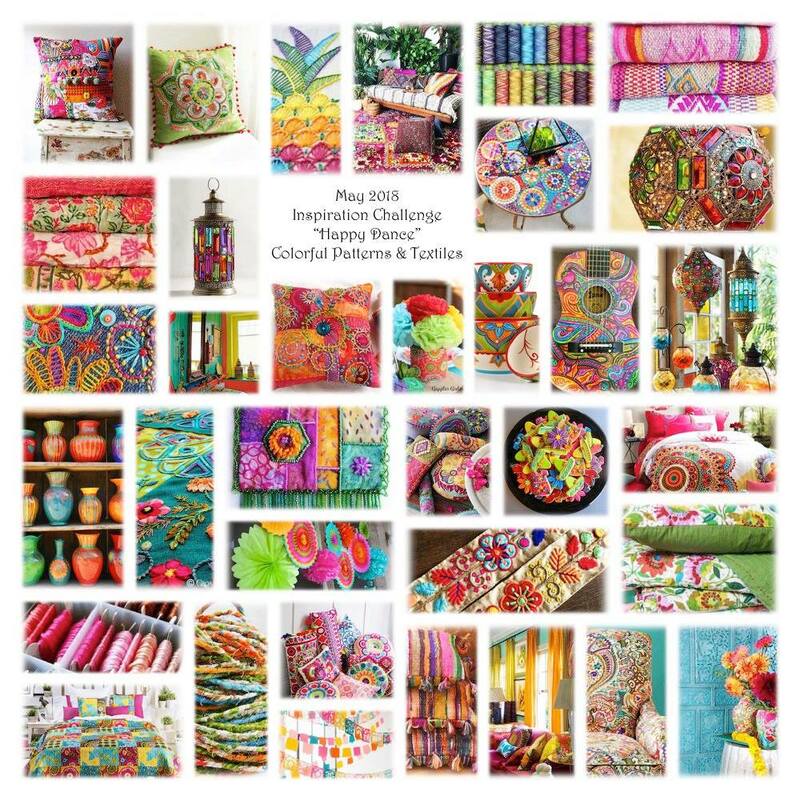 When I shared some of the Challenges and Inspirations for May, I included the one for Artisans Create Together Facebook Group. However, I have to admit that I wasn't planning on working on it. Once I studied the inspiration collage though, my muse wouldn't be silent. The bright pops of color and boho style reflected in the collage really spoke to me. I knew I had to create a shabby bracelet. Here's a look at the original collage. It was the pinks and blues that first stood out to me along with the stitching. I made sure to include both. 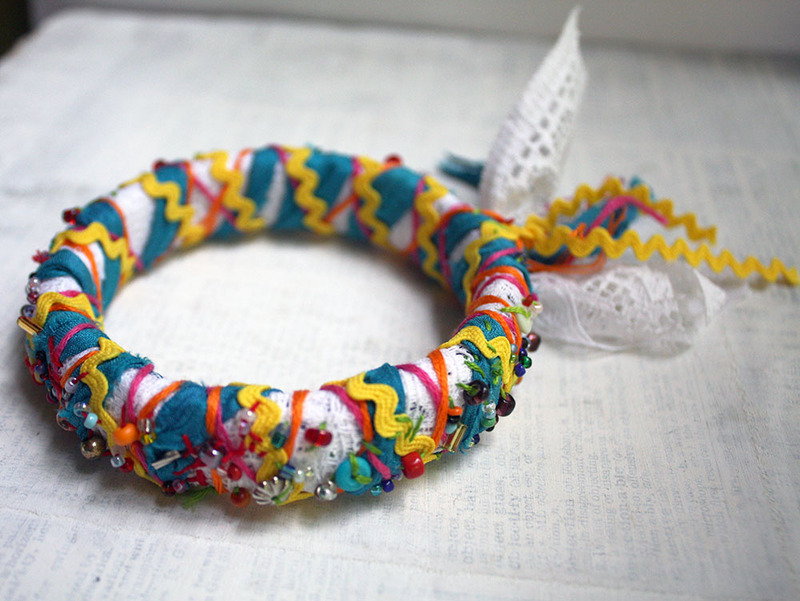 The base of the bracelet is an old plastic bangle that I wrapped with lace, recycled sari silk, embroidery floss, and ric-rak. 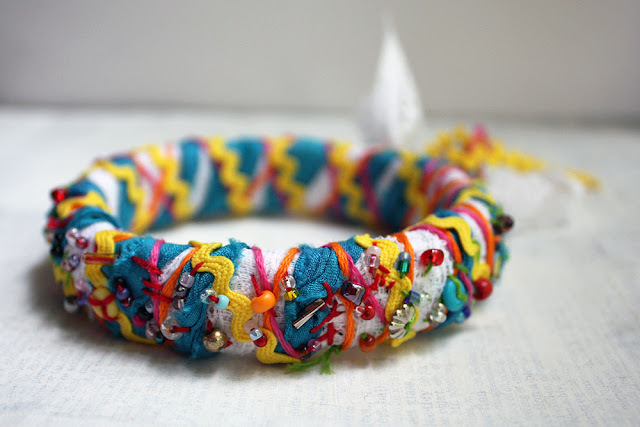 Once I secured the fibers by tying them, I began to add beads and stitching. 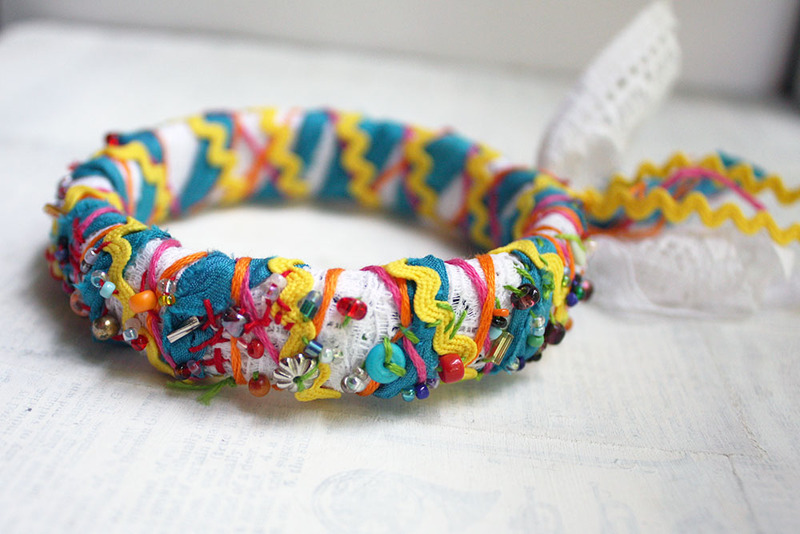 I sewed on a bead soup of miscellaneous small beads and added small stitch patterns with more embroidery floss. I really adore the patchwork-like feel of the whole thing. Once again, I was reminded that the jewelry challenges and prompts that I find really can give loads of inspiration if I just give them a chance to marinate. Check out what the other participants created for this challenge in the May 2018 Challenge Album. Did you participate in any challenges this month? Great bangle! Fun, whimsical and ever so cheerful! Challenges certainly can be a good source of inspiration. I remember a time when I was always on the lookout for a new blog hop to participate in. I've tried FB groups a little bit, but it just doesn't have the same feel. Thanks Liz! I agree that the feel isn't there. But, blogs seem to be disappearing left and right. As such, the blog hops are too. I think I have a hard time keeping up with all the facebook groups I've joined so it's hard to track the challenges. I'm always trying to keep my eye out, but FB is so full of everything that it's hard to weed through it all. 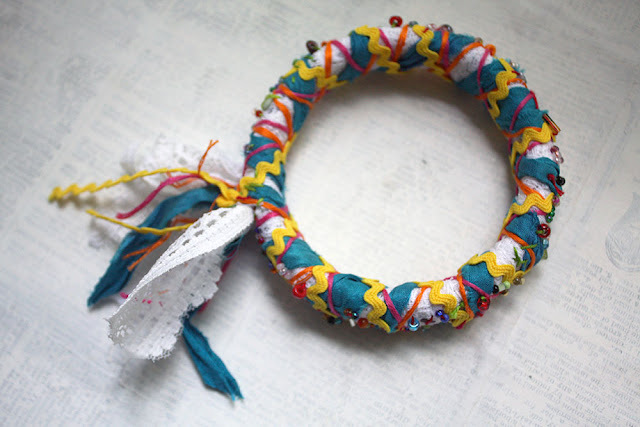 Oh, yes, the perfect boho accessory and it looks like jig-sawed from the inspiration board! Great bangle, Hope! Hope, this is just the cutest.. Perfect for the summer..
Chelle, Thanks so much! It was a lit of fun to do. Adding the beads and stitches is somewhat meditative. I enjoy that part of the process. So glad you like the results! !